In 1995, Dark Horse Comics published Aliens vs. Predator: Duel, a two-issue miniseries that introduced the concept for an Alien/Predator hybrid. A decade later, the idea made it into the films with Aliens vs. Predator: Requiem. Which means it also got a NECA toy. 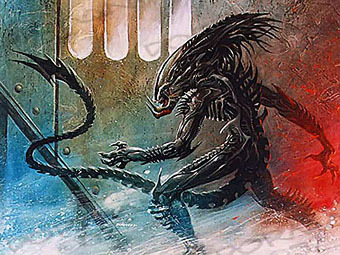 The idea of a Predalien didn't originate in the comic, however: in 1991, Peter Briggs wrote an AvP spec script that was unexpectedly purchased by Fox. This script included a scene with the cocooned body of a Predator, suggesting it had been used as a host. Though the film was never made, it got far enough that concept art was created, including a piece by Dave Dorman that gave the world its first glimpse of the monster. Both the comic and the movie hew pretty closely to Dorman's art. Of course, there are only so many ways to combine an Alien and a Predator, so maybe that shouldn't be a surprise. The design they went with is basically a normal xenomorph body, but with a little more musculature instead of just a hard, chitinous exo-skeleton. 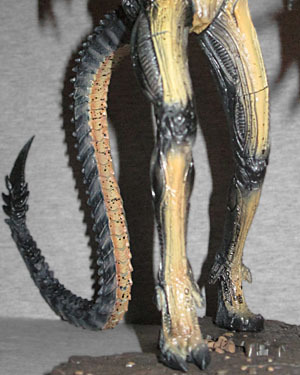 There are some classic xeno touches, like the ribbed panels on the thighs, the double thumbs, the dorsal tubes, etc., but this is clearly a unique creature and not just a repaint with a new head. The head is where the cross-breeding is most obvious. 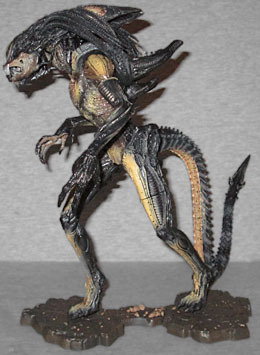 It's long, like a xenomorph's head, and actually flares out a little at the back because this Predalien is half queen. There's a clear dome in the front, with a skull visible inside it. His jaw opens, and there's a second, smaller mouth inside. Those are all Alien features, so from the Predator we get the mandables and the dreadlocks. 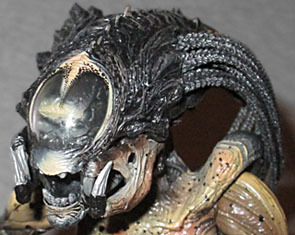 AvP:R was a very dark film, so the designers had to make sure the Predalien would be recognizable even in low light. Another feature the Predalien gets from its mama (papa? Which species is which in this arrangement?) is its coloration. Rather than being solid black or brown or blue, this beastie inherits some of the Predator's yellow skin. It's mainly up the front of the legs, the underside of the tail, across the chest and onto the shoulders, but it gives the figure some depth and helps break up the shapes. There's a speckling on the light areas, and the teeth/fangs are silver. 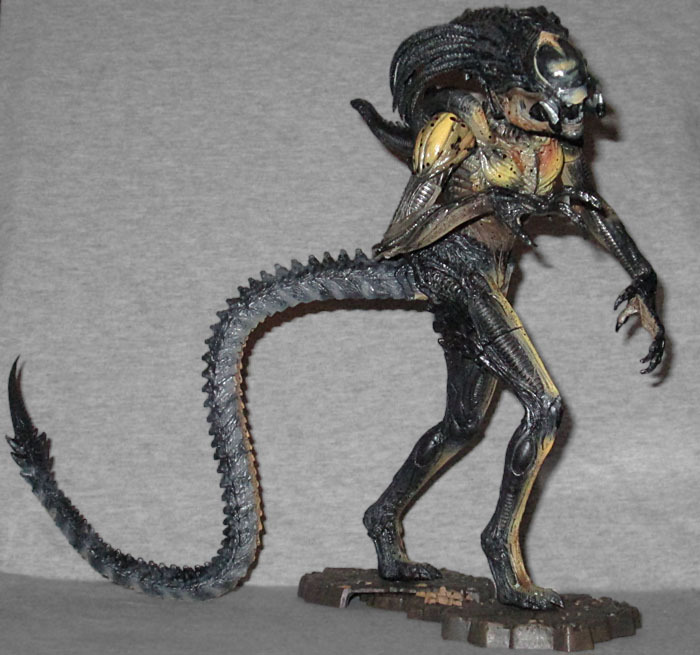 The Predalien was made in 2007, which was before NECA started giving their toys really good articulation. Consequently, this is very pre-posed. It's striding forward and twisting drastically to the side, and it will pretty much always be thus. The right arm is bent and held near the chest, while the left is ready to strike. The toy has swivels in the thighs, hips, wrists and biceps, balljoints for the shoulders and head, a hinged jaw, and a bendy tail. There were two versions available: one with the mandibles spread, the other with them contracted. To keep the toy standing, it comes with a display stand. It's the same the regular AvP:R Alien came with, two pads connected by a strip of dirt. The base has two swivel joints underneath, allowing you to fine-tune its positioning under the figure. It's not the greatest thing ever, but it's necessary, so it's nice that NECA included it. Aliens vs. 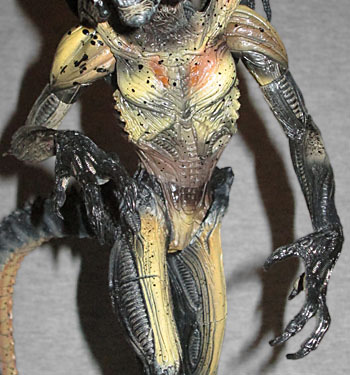 Predator: Requiem is kind of a poo movie in every regard, but the Predalien is a fairly cool design. Similarly, this figure is old enough that NECA wasn't at the top of their game yet, so there's a lot of room for improvement. They've teased that they want to make a new version of the Predalien, but that would be 2017 at the earliest. If you want this unique monster, this is the only way to get it; so basically, we're glad it's as good as it is, rather than being upset it's not better.